Two weeks ago Wake Island’s nearest neighbor, the Republic of the Marshall Islands, filed suit in the international court at The Hague against nine global nuclear powers and in federal court against the United States. The lawsuits demand that these nations meet disarmament obligations established by international treaties. I looked into it at the time and watched for reactions and follow up in the coming days. Not surprisingly, it caused barely a ripple. The U. S. State Department asserted its dedication to achieving disarmament, and Russia called the lawsuits baseless. Both nations declared that they have reduced stockpiles by 80 percent in the decades since 1970. Still, nuclear weapon states trot out their missiles when circumstances call for a display of muscle, as North Korea did last spring and Russia did a few days ago. Russia and other eastern (ex-Soviet republic) nations engaged in military maneuvers on May 8 that included firing missiles from two nuclear submarines and the launch of a Topol intercontinental ballistic missile in northwestern Russia. Given the rising conflict in and with neighboring Ukraine, the timing of Russia’s “exercises” was no coincidence. As the Russian defense minister stated, “Present-day challenges and threats to the nation’s security make it imperative to maintain the army and navy in a state of readiness for quick and efficient counteraction under any circumstances.” That statement could be made by any nation at any time and justifies the maintenance of the nuclear status quo, in spite of broad commitment to the principle of disarmament. One odd thing about the Marshall Islands “David vs. Goliath” lawsuits against the nuclear weapon states is that there is no mention of the Ronald Reagan Ballistic Missile Defense Test Site smack dab in the middle of the Marshall Islands. This is the U.S. Army Kwajalein Atoll (USAKA) facility, which incorporates Wake Island in testing operations. It is the only treaty-approved launch site for the U.S. to test “operational” strategic ABM interceptor missiles and has supported multiple other system developments. Japan held the Marshall Islands as mandates following WWI and fortified the islands for offensive operations in WWII, including attacks on Wake Island in December 1941. American forces captured Kwajalein atoll in early 1944, breaking Japan’s defensive perimeter. At the end of the war the U.S. Navy established a refueling and communications station on Kwajalein. Between 1946 and 1958, the United States conducted sixty-seven nuclear weapon tests in the Marshalls with significant health and environmental impact. 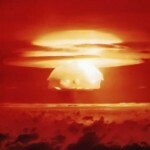 The 1954 “Castle-Bravo” shot released a fifteen megaton blast (Hiroshima times a thousand) on Bikini atoll. In 1959 the U.S. Army and Department of Defense selected islands in Kwajalein atoll for anti-missile and advanced research projects, becoming the Pacific Missile Range Facility Kwajalein, with command officially transferred to the Army in 1964 for the NIKE-ZEUS project. The site was renamed in honor of President Ronald Reagan in 1999. The existence of the Reagan Test Site in the Marshall Islands would seem to lend significant context to the Marshall Islands’ lawsuits against the nuclear weapon states. An independent republic since 1986, the Marshallese population is 68,000 over 24 atolls. The lawsuits do not claim compensation for previous damage in the Marshalls (a bilateral Nuclear Claims Tribunal is supposed to assess and compensate for damages), but there is good reason for tiny Marshall Islands to be the one to raise the issue. What does disarmament mean, really?